This week I had a conversation that I've never had before. It made me want to smile and want to cry all at the same time. Student: What tone should I use for this essay? Student: You know, how should I word it? What are you looking for? Me: Let's look at your mentor articles. How did these authors go about it? This one had more of a conversational tone and this one had more of a formal tone, so which tone do you like most? Student: You mean I can write how I want to write and what I want to write about??? Student (male by the way): Oh, well I'm good then. I'll be good at this! And you know what? He was good. 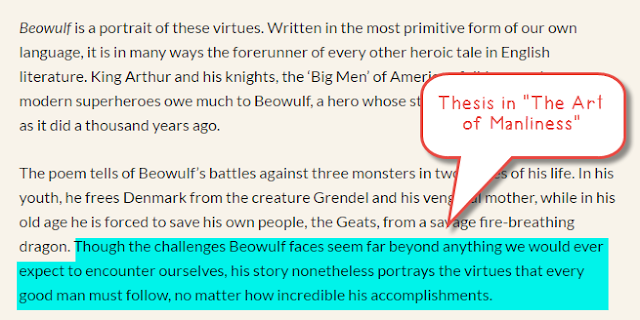 He wrote a beautiful and passionate article about how the universal themes in Beowulf can be applied to his weight loss journey (he's lost 60 pounds and carries a gallon of water with him every day!). The reason this made me want to cry was that I wish I had been doing this type of writing all along. Simply calling it an article made all the difference. Students hate essays, but they don't hate expressing themselves in a format that seems relevant. There is a difference. It wasn't until reading Write Like This: Teaching Real-World Writing Through Modeling and Mentor Texts by Kelly Gallagher that I even came to this realization. I'm 10 years into this teaching gig, and it saddens me to think of all the boring/traditional essays I've assigned in the past. I do believe that there is time and place for traditional essays in the classroom because they will most definitely show up on standardized tests, but I now wholeheartedly believe that if you can find a way to incorporate real-world writing into the classroom, then overall writing in every style will improve. When I first starting reading Write Like This, I almost dismissed it. I thought his practical examples and ideas were great, but they seemed to belong in a stand-alone writing class such as journalism or a creative elective. None of them seemed to fit themes or go along with literature. However, after thinking about it more and finding some literature-based examples further on in his book, I began to realize that I could apply his ideas to almost any literature we were reading because the basic concept is this: Find real-world mentor texts. Have students mimic these texts. Mimic the texts yourself for modeling. 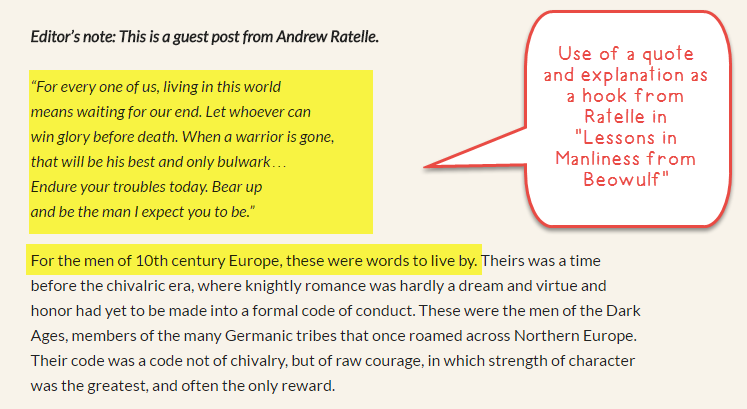 After finishing the epic, I had students zigzag read real- world articles on Beowulf. No matter if you are writing a college entrance essay, starting a business, or running a non-profit foundation, telling your story is the most important part. Without a story, no one will connect to your words. 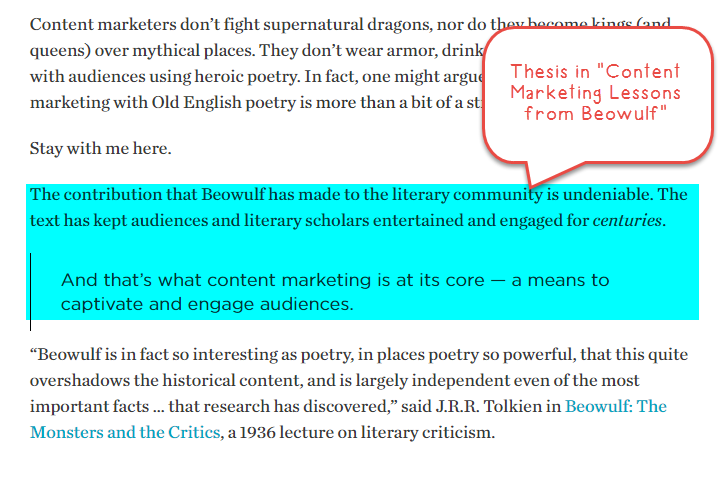 Since the beginning of stories, with Beowulf being the first one in the English language, humans have used these narratives to shape their own lives and businesses. ***If you are reading this because you want an example and don't need Beowulf articles, I found these by googling "Beowulf and Business" which led to lots of leadership posts. I suggest starting with "________ and business" and then go on to "lessons from ________". I also found some articles for Lord of the Flies using this searching same strategy. You can find those in my Pinterest board: Informational Text Pairings. 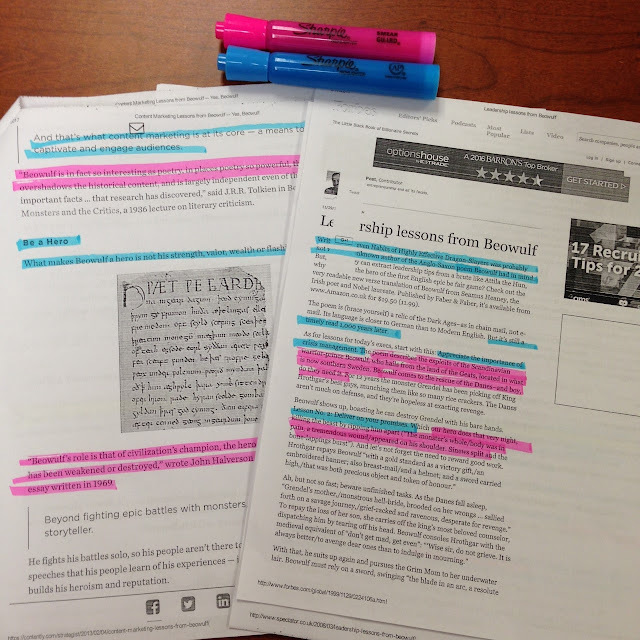 Next, we did a did a close reading by highlighting the thesis statement and all main points (topic sentences) in blue and proof from Beowulf in pink. Then, I gave students this prompt to think about for homework. Using a passion, interest, or future/current job, write an article about the top 5 lessons you learned from Beowulf that can be directly applied to your topic. This will have an introduction and a conclusion, but the middle part will be in 5 sections that have the lesson in bold and the explanation with examples under it. You will need to use Beowulf and one outside source with MLA citations within your article. The next day, we reread the articles and discussed the thesis statements more in-depth and wrote our own. After that, we filled out the rest of our introduction by observing what our model texts used as hooks and background information. After writing our introduction paragraphs, I modeled how the body of their article should be written by looking at the mentor texts and then writing my own example in front of them. 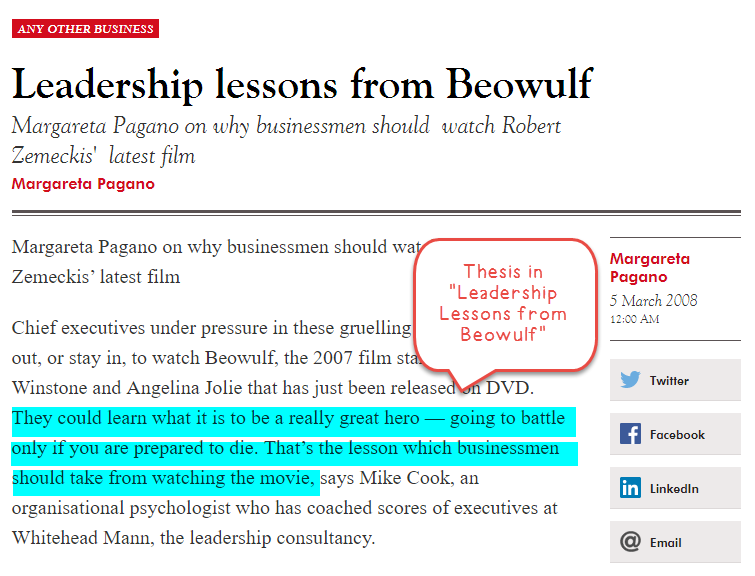 I chose "Teaching lessons from Beowulf" as my topic (obviously). I personally wasn't brave enough to talk it out while doing this as Write Like This suggests, but I did type it out in front of them. I told them that I was going to be working own my own while they worked on theirs. Out of the corner of my eye, I could see almost all of my students stop what they were doing from time to time to watch how I changed things and worked through my ideas. Later on, I did go into detail about my word choice and sentence variety, but that wasn't until it came time for revision. Never let one monster of a student ruin your entire class community. Teachers and students spend more time with each other than they do with their own family members, and because of this time together, it's important and natural to form a classroom community. When the community is good, everyone benefits. When the community is terrorized by one rogue student, everyone suffers. Hrothgar knew that nothing good would ever be able to happen in Herot after Grendel decided to destroy their peace, so he "gave places to the Geats" and welcomed Beowulf to help him rid his community of the troublemaker (Raffel 49). Don't be afraid to welcome help (even when you didn't ask for it). Though Hrothgar was a powerful king, he wasn't afraid to welcome the unsolicited help of Beowulf. Beowulf arrived with a request and boasted," The days of my youth have been filled with glory…grant me, then, …a single request…to purge all evil from this hall" (Raffel 144-166). It would have been easy for an authoritative king to dismiss this arrogant vow of service, but Hrothgar didn't let pride get in the way of doing what was best for his people. Being the kings and queens of their classroom, teachers can sometimes bristle at unsought support; however, accepting help from an experienced teacher is a sign of strength, not weakness. Use the right tool for each quest. 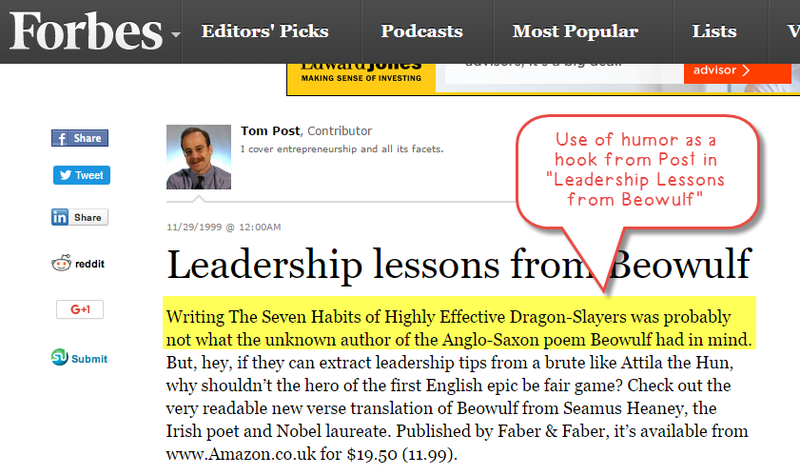 Beowulf has a keen sense of knowing which tools to use in every situation. With Grendel, he didn't use any weapons, but with Grendel's mother, he realized that a giant's sword was needed to get the job done. Likewise, teachers should know when tools such as computers, apps, and manipulatives are best fitted for each learning quest. For example, if the goal is to help students read complex text more efficiently, then Common Lit's new guided reading tool might be the best-suited weapon. This tool is perfect for this job because the "guided reading mode focuses on ensuring that students of all reading levels are able to follow along with and comprehend complex texts" ("New Features from Literacy Tool Continue to Help Struggling Readers Manage Difficult Text"). The best part about this assignment is that I told my students this wouldn't be a 7 paragraph essay (they are used to writing the common 5 paragraph essay) because some of their points might need less explanation than others and therefore not making each point a full paragraph. Turns out that ALL of my students got into the flow of writing and just kept going on each one. I did too as you can see above. So basically, I tricked them into writing a substantial essay without complaint simply because I called it an article, made the format something different from what they were used to, and allowed them to write about what they were interested in. I'm going to call this one a win! If you want the prompt and examples above in an editable PowerPoint or Slides, please sign up below. Be sure to check your email spam and promotions folder if it doesn't go through. If you already subscribe and would like this PowerPowerPoint as well, just email me and ask for it. 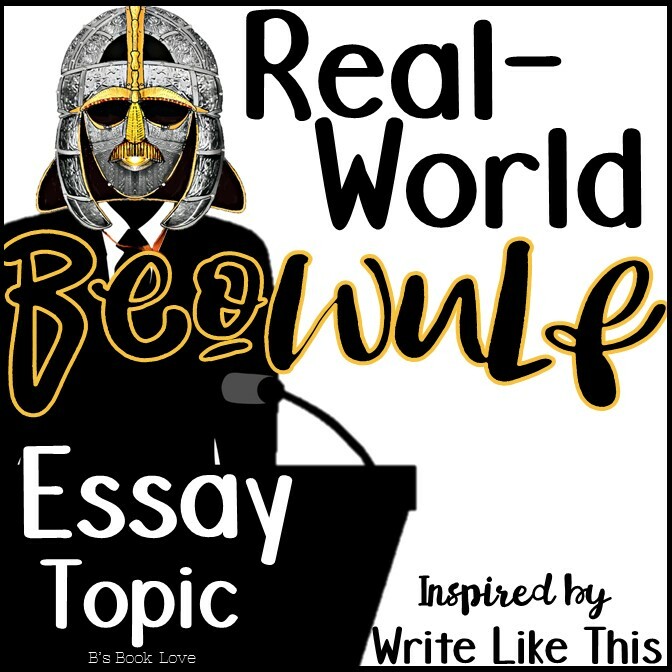 If you are looking for an entire Beowulf unit plan with real-world activities and informational text, please check out my entire Beowulf lesson plan pack here: Beowulf Unit Plan Within it, you will find a fun interview assignment, confidence boosting articles, creative writing on the dragons we face in life, and lots more. Write Like This linked above is an affiliate link. If you think that you would enjoy more real-world writing examples like this one, I would love for you to support my blog by using the link I provided. It doesn't cost you any more money, and I get a tiny percentage in a return. Thank you! Ability to persuade the target reader in the significance if the discussed topis is one of the main functions of the introduction part on an essay. Click how to write a good essay introduction and you will find an article that is dedicated to essay writing. 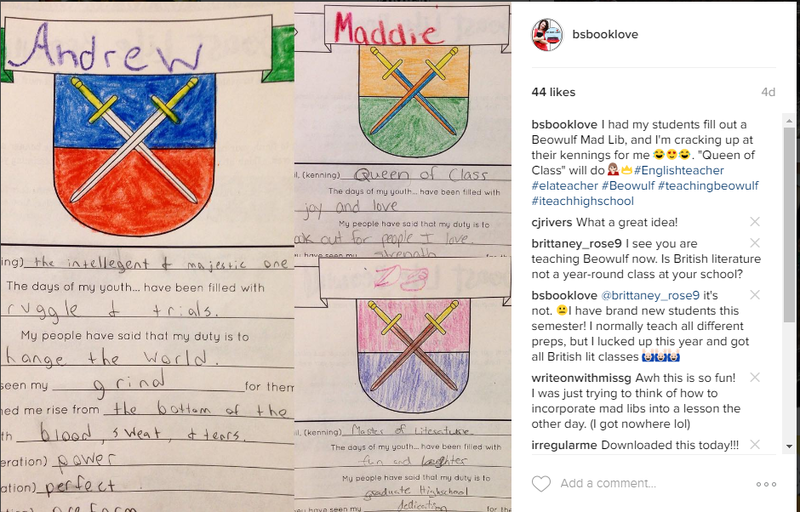 I love this idea and I really want to implement it into my senior English curriculum after reading The Little Prince. There's so many life lessons that students could take away this from book. Do you happen to have a rubric that you use to assess these? Or learning objectives? So do you just use your state's argument essay rubric? That one without the counterclaim works and the explanatory one does too! Great article it got a lot of interesting and informative things in it. If you want to pay someone to write my essay then Get the best essay writing service apex essay which will give you excellent quality written content. How do you start your essay? Does your professor give you a list of topics , plan, etc? Thanks for the informative article on Essay Help. This is one of the best resources I have found in quite some time. Nicely written and great info. I really cannot thank you enough for sharing. Very interesting post, I thank you so much. 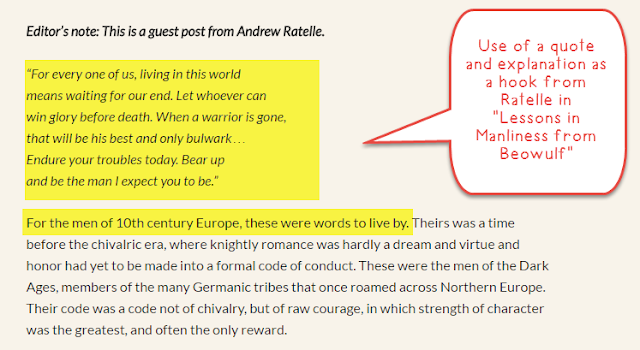 I agree that a story in your essay can make a positive influence on a reader. It's a way to impress somebody who read your essay more than your competitors. Thanks for taking the time to discuss this, I feel strongly about it and love learning more on this topic. khaitan pre school If possible, as you gain expertise, would you mind updating your blog with extra information? It is extremely helpful for me.